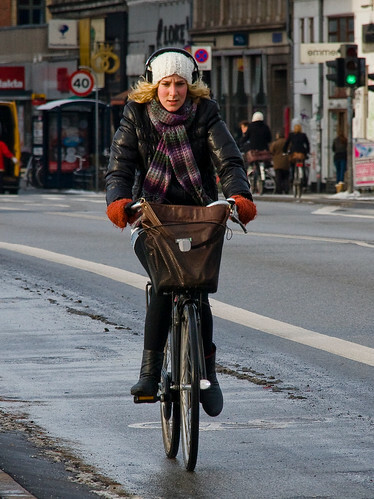 Nice, really want a fur hat for cycling. Are you too poor to afford an automobile? Maybe we could all send you a euro and then you can buy a used Lada. Poor? Lol. Here's a list of the world's richest countries. you figure it out. send the money anyway, we'll use it on cafe lattes. I don't think she is poor ... but is making us understand the effect of Global Warming ... and riding a bike is a good way to have a healthy life !!!! keep riding the bike ...and nice shoes ! Do people really ride this much in winter. Here the only people out riding in winter are those training for a race or in a riding club. I NEVER (even in warm weather)see people in work or dress clothes riding. I LOVE it!!! I wish it was the cuture here... we could all be healthier. 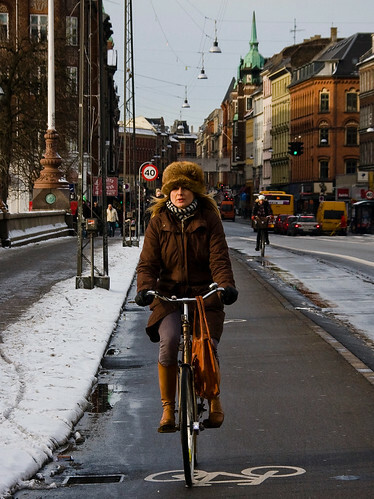 Copenhagen offsets high latitude short days and lack of sunshine with CycleChics. It works. I can even feel it here thousands of miles away. Nice blog! Greetings from Romania. Keep up the good work. You make me happy every day with your posts. We have -25 degrees Celsius so I cannot ride my bike anymore. e sorrir muito da beleza da vida. floral e me aflorar em teu peito, te fazer menina. E te ver tão linda, mas, que só meus olhos a visse. Como faz o amor a quem se cega. como se fosse uma prece, como quando eu te chamo. Queria-te tanto assim, como... sonhos reconhecendo sentimentos. José dos reis Santos - poeta del Brasil. Boa noite, belíssima – beijo do poeta! Inspirational photo. Our bikes are hanging in the garage until the snow flakes stop falling. healthy and chic .. certainly! Does everyone have amazing boots there, or do you just find the fashionable ones, pedaling away? I love your pictures and blog. My only question: Are they really listening to music on those headphones? While biking? These are awesome! I love your blog. Poor? Some of these people are wearing clothes that are worth more than my last car. Hell, some of these people are carrying BAGS that are worth more than my last car; which wasn't a Lada. I sold the car, not because I was poor. It was because I never used it; I had a bicycle. So a guy walks into a parts store and asks, "Could you give me a rear view mirror for my Lada?" The guy behind the counter thinks for a minute and replies, "Yeah, I guess. Sounds like a fair trade."